Where did April go? It seems as if I just blinked, and missed it! There have been so many tasks that needed attention after my long illness, not to mention I’m still weak as a kitten, so here I am, a week late. However, as my brain has been functioning reasonably well again, I have some new designs to show off. 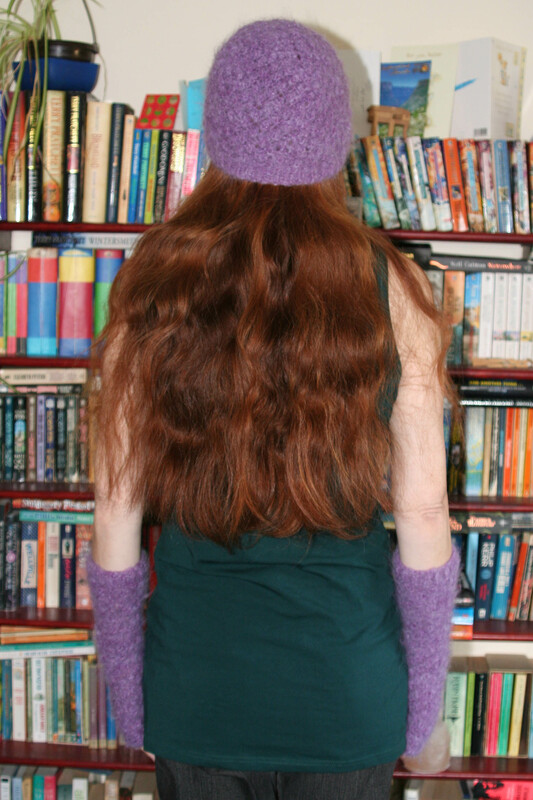 The Harry Potter films contain so many lovely knitted garments, I started with my version of the textured hat Hermione wears in the Godric’s Hollow scenes, in order to ease my way back into more complex designs (see the books on the bookcase by my left shoulder?). I know there are other versions of this hat out there, but I felt challenged to get closer to the original. Not to mention the fact that I needed new fingerless mitts, as my current two pairs are disintegrating after years of faithful service. It’s contrary of me, I know: even though making a new pair wouldn’t take me much time or effort, I’ve delayed doing so because I’m so fond of the old ones (which are scandalously tatty). But a ball of Cushendale alpaca in my stash demanded to be knit up at last, so here we are- what do you think of the likeness? Either way, trying to adapt someone else’s idea to the materials available is a good design challenge, like flexing my mental muscles! Plus, it’s been a mainly miserable April, so I’m glad of the warmth. Ideally, I think a thinner alpaca yarn would be closer to the original, but my stash isn’t comprehensive (yet!). 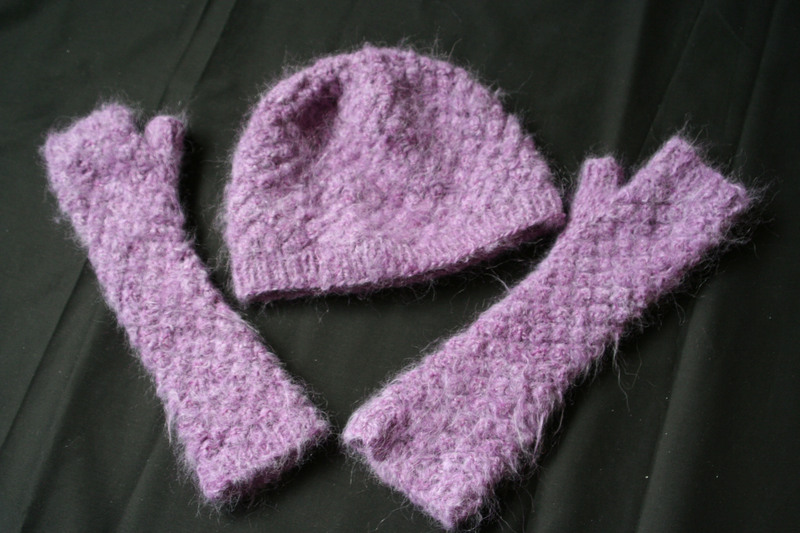 Added bonus: this set only took one ball of yarn! Because the intense colours of Cushendale yarn always cheer me up, I decided to design a straightforward triangular shawl in their boucle mohair. 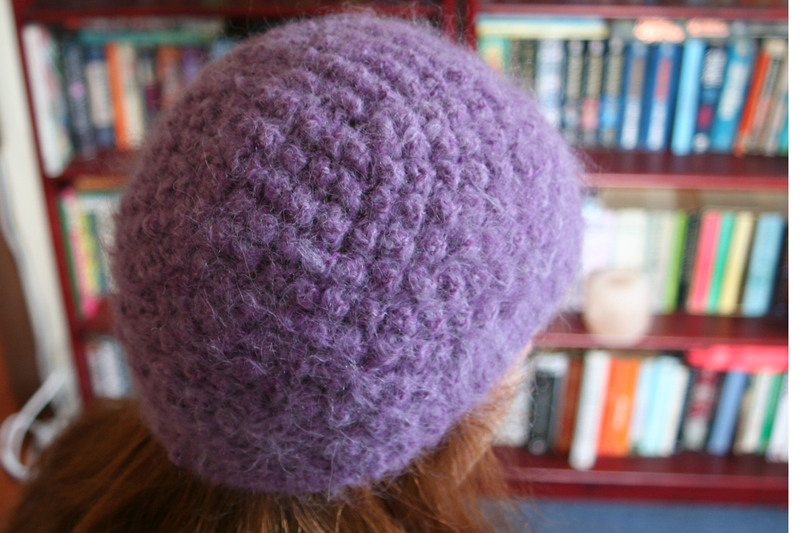 The stitch pattern is a little complicated, though, so this is not for absolute beginners like the Hermione ensemble is (that’s so much easier than it looks, honest). 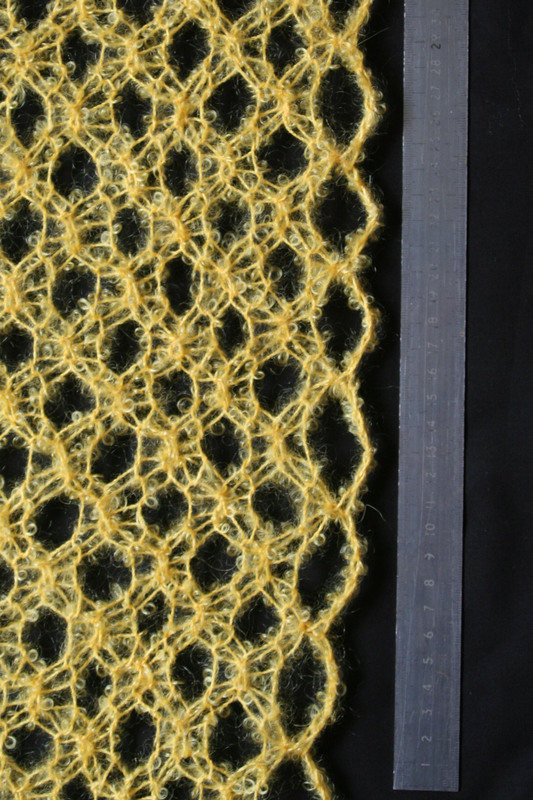 Those are centimetres on the ruler, by the way, not inches- it’s airy, but not a fishing net! I was really lucky while I was sickest, in the sense that the school had Easter holidays during those weeks, so I didn’t let the children down by missing their knitting class. It’s great fun now, because about half the class is very enthusiastic and the other half does painting and similar things while we get stuck in. Many of them have finished their first fingerless mitts (constructed out of rectangles of garter stitch folded sideways around the hand), and a couple of the boys have graduated to purling. A few children got so carried away that their glove rectangles morphed into bags, neckwarmers and even scarves before they realised that it was possible to stop! It’s amazing how different their approach to knitting is depending on their personalities. Some of the shy, middle-of-the road students are blossoming as they discover an unsuspected talent, and some of the pernickety ones are becoming more relaxed about making mistakes (my motto: sew buttons on the holes, and avoid ripping back- it’s too disheartening). 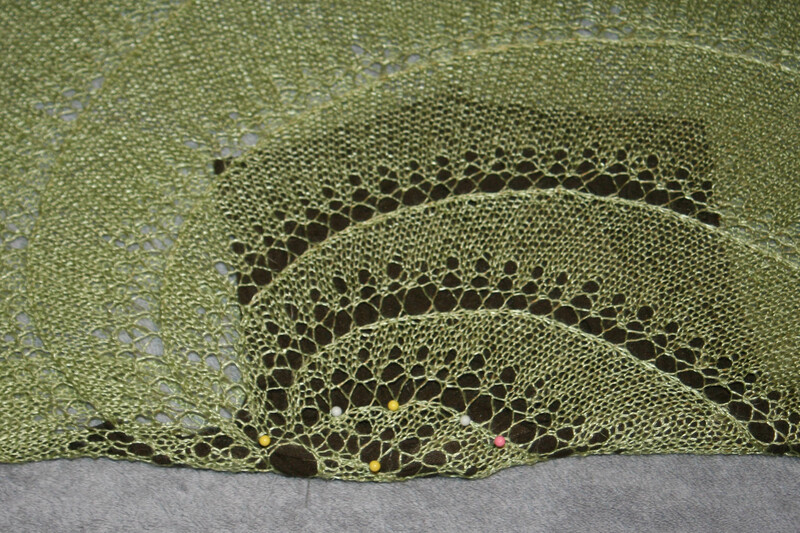 I think I showed you this photo before, or at least I planned to- there are a lot of details lost in the fever dream that was March-April – but anyway, this is the beginning of a simplified version of my Pensieve shawl, in viscose-linen (Yeoman). 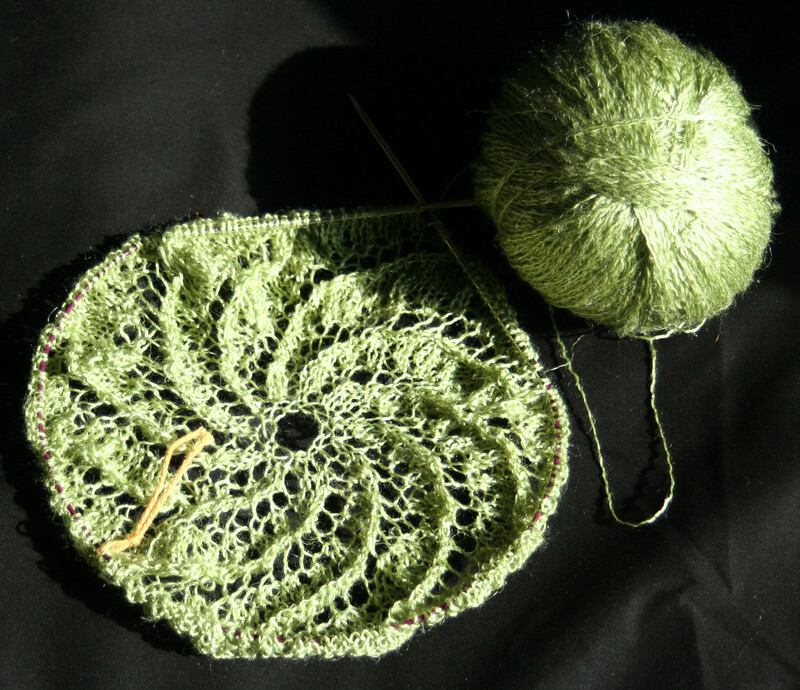 Now the original Pensieve shawl is circular, like Dumbledore’s Pensieve, but in general I am not a fan of circular shawls. 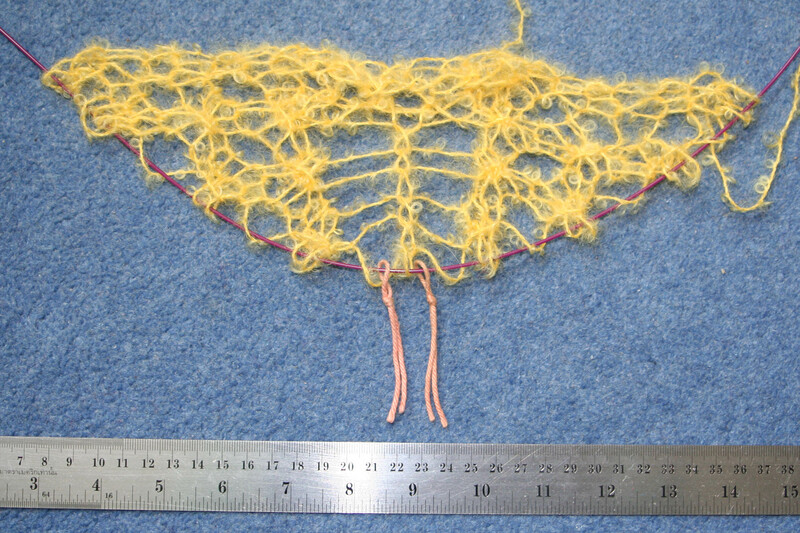 They can’t really be worn spread out flat (except when draped on models who obviously have no intention of moving an inch), so they end up being folded in half, which obscures much of the lace pattern and leads to a large volume of scrunched-up shawl at the nape of the neck, if the shawl is to sit comfortably on the shoulders. Since the nape of the neck is usually an attractive part of the body, I object to hiding it unnecessarily. 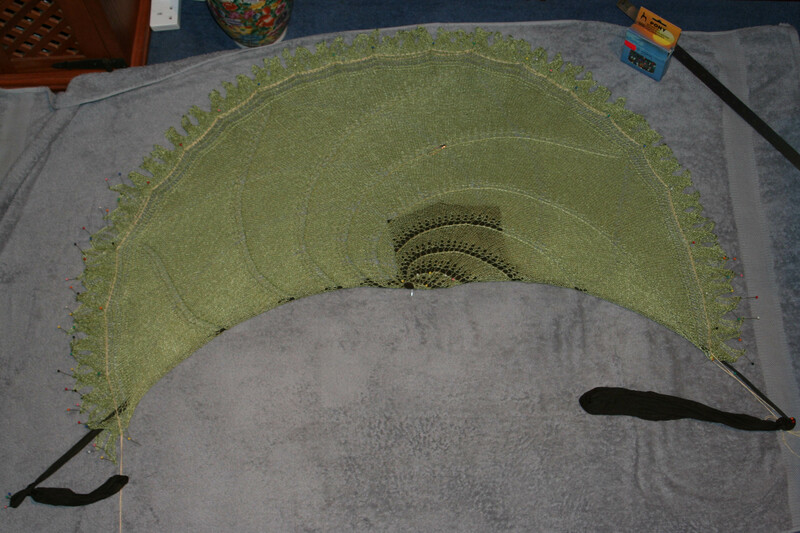 So this Pensieve shawl is more than a circle, with extra segments added so that it will drape around the shoulders when folded. Furthermore (tah- dah!! I’m especially proud of this), the top half of the folded shawl is so fine that the part on the lower half can be seen through it. I’m still trying to take a photo to show this properly, but it works. 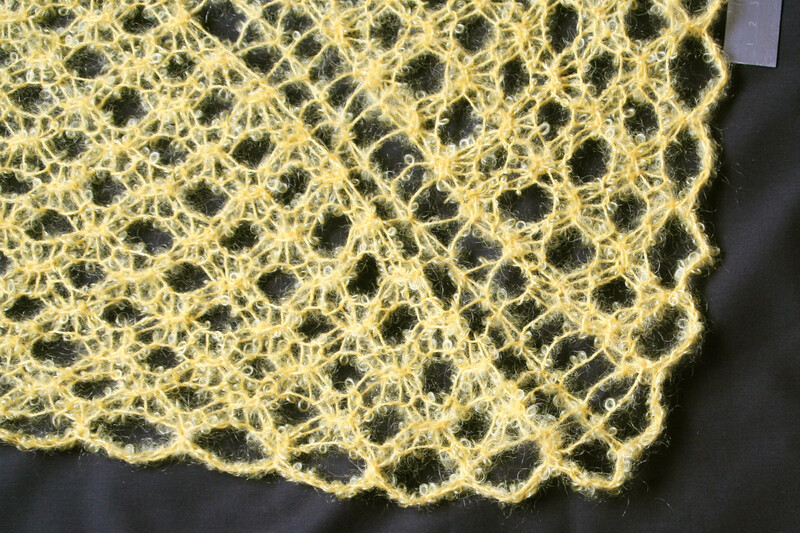 Looking at this photo, I think I should have pinned the shawl out again on a dark background- oh well, next time. The dark blob you see here is a pair of tights (I believe Americans call these pantyhose, or is that something else?). In order to block a more-than-circular shawl without creasing it horribly, I used these tights. Once the shawl dried it was crease-free, and viscose-linen blends drape beautifully, so this smaller version with its narrow edging is a very satisfying quick knit- just what us convalescents need…. Now all I need is a summer to wear it in! This entry was posted in Knitting and tagged blocking, Boucle mohair, clothing, Cushendale, fashion, Godric's Hollow hat, Harry Potter, Hermione, Hermione's hat, knitting, lace, pensieve, Pensieve shawl, Shawl, yarn. Bookmark the permalink. I’m so glad to see a new post. How wonderful – these colors and work are such an inspiration… It’s been a rough go for my family of late. We lost two loved ones on the same day and are only now starting to return to “normal”. The hardest funeral was burying my sweet niece’s baby- little Violet. I’m looking forward to summer and sunshine and no more grief. lovely to have you back, Pauline. You were missed. Glad you are up to posting again. 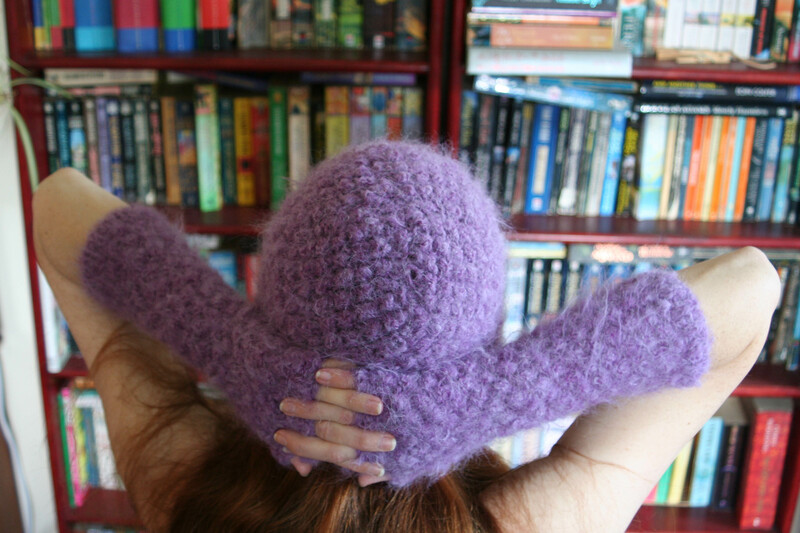 Love the hat and arm warmers. Will your pattern ever be posted? The shawl is absolutely beautiful. I am starting my first sweater tomorrow – have lesson scheduled at my favorite yarn shop to get it going. Wish me luck! I crossed my fingers for you. Well, how did it go? Starting off with an expert to ease you in to the process is a very good idea, because that’s the most difficult bit… except maybe for the neckline! Seriously, hope you’re having fun. The sweater is started and is going well. I just have to remind myself to take my time and keep my hands relaxed. It is quite exciting to see it growing ! With time, you’ll find that you automatically relax when you pick the knitting up… just one of the perks!